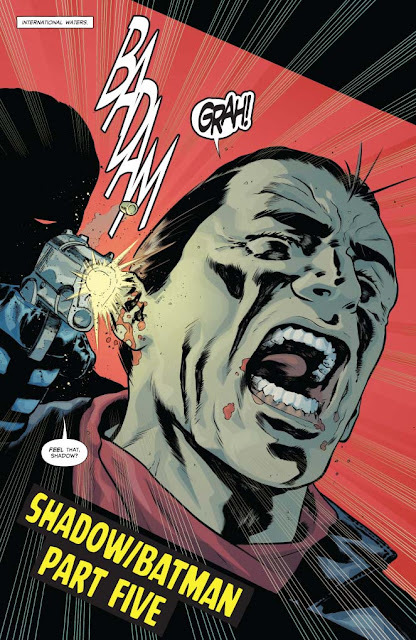 The issue starts with Shiwan Khan shooting part of The Shadow's right ear off. As opening pages go, this one is bold and certainly makes a statement. And much of this issue does indeed deal with The Shadow's pain – of one sort or another. I can't help feeling, though, that Orlando's overegging the pudding with Khan just a little. To hear him speak, you'd think he was responsible for pretty much everything that ever happened to Batman, something that the first series also suffered from with The Shadow's bold claim that he had trained Batman and watched over him during his career. The effect for this reader at any rate is that his character risks destabilising the story almost entirely. 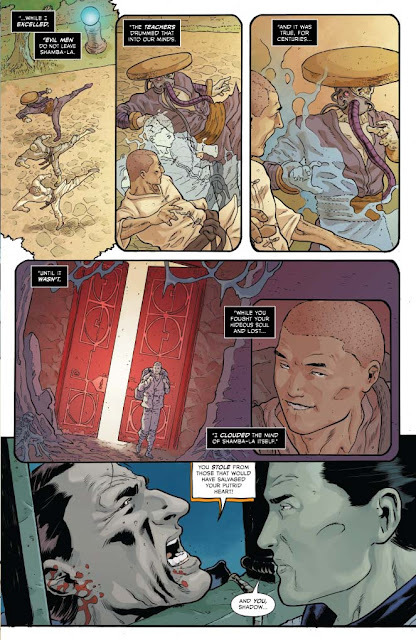 If Khan and Ra's Al Ghul really do secretly control the world, what does that mean for people like Vandal Savage or, for that matter, the Justice League? There's a fine line between building a credible world-threatening villain and making someone so powerful that it's hard to see exactly how our heroes will overcome him. The Ra's/Damian fight is, however, pretty satisfying, although Damian's dialogue is, because it is tasked with conveying significant plot information, largely terrible. So, too, are the scenes in which Batman stares at a monitor screen trying to work out where his son is, a moment whose tension is undermined by the fact that Ra's has just explained to Damian (and us) how he can render various parts of the globe invisible through the judicious use of mind-controlled dead people in numerous monitoring and surveillance facilities all round the world. 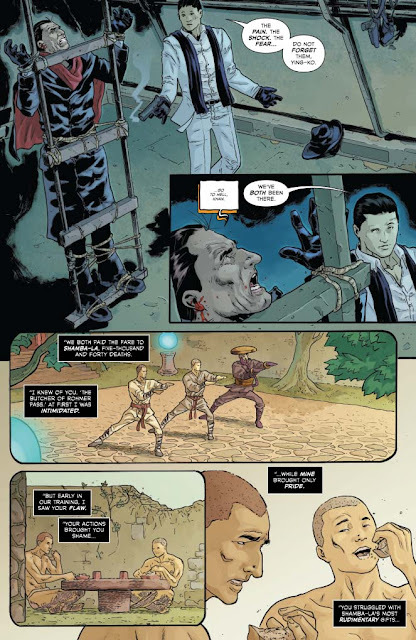 While the tension between Ra's and Damian, and Shiwan and The Shadow is well-worked, having Batman twiddling his thumbs for most of the issue (at one point, he goes and does a bit of underwater spot-welding to "clear [his] head") is not great – especially considering the fact that his 'big' deductive revelation is one that the reader probably already worked out three pages ago. That said, while Orlando's more or less lost any kind of grasp of the character of Batman, he does seem to have a pretty good understanding of The Shadow – or at least he understands how to put him through the wringer. The final scene, in which The Shadow is threatened by a 'reanimated' Damian is genuinely impressive. Partly this is to do with Giovanni Timpano's artwork. Timpano portrays mental anguish extraordinarily well and the sheer tension generated by The Shadow mentally holding a bullet millimetres away from his own head is palpable. The ending is a bit predictable, mind you, but I'm not too concerned. It sets up the final issue rather well. 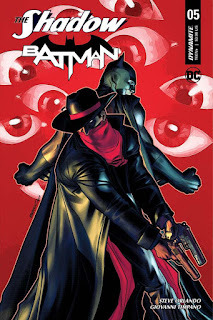 This penultimate installment, then, is entertaining enough – but perhaps not if you're a fan of the kind of Batman who actually does things. The extent of Shiwan Khan's influence and power remains almost unbelievably vast, though, and raises all sorts of questions about the nature of the world the characters inhabit that the story clearly has no intention of answering adequately, if at all. Timpano's artwork, however, is strong – emotionally visceral in parts, pleasingly dynamic in others – and, although the odd Orlandoism emerges to render the dialogue less than fluent, the story is paced reasonably well and ends in a satisfyingly dramatic and exciting manner. The unevenness of this series continues and, although this issue ends very strongly, it drags for significant portions and features a Batman who is curiously uninvolved in much of the action. Always dynamic, Timpano's art is, at times, extremely powerful and none more so than in the final few pages. While by no means a classic, this is decent, solid story-telling that delivers a dramatic punch at the end that guarantees that this reviewer, at least, is looking forward to the final issue.